Asia Ramazan Antar was one of the most famous faces of the fight against ISIS, but now the 19-year-old dubbed the “Kurdish Angelina Jolie” is dead after sacrificing her life to stop a trio of ISIS suicide bombers. Antar was a soldier with the famed Syrian Kurdish Women’s Protection Units (YPJ), an all-woman force that had been taking the fight to ISIS in the war-torn country. She gained fame for her youthful good looks and her apparent similarity to actress Angelina Jolie, as well as her feminist stance in a region where women are often oppressed. But Antar’s short life came to an end this week when she stopped a trio of bomb-strapped cars making their way to the Kurdish front lines in Syria. 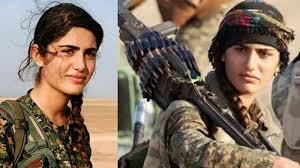 As the Times reported, Antar and her fellow YPJ fighters went on the offensive, taking out two of the cars. The third car was able to get closer to the Kurdish fighters, exploding and killing Asia Ramazan Antar. “She and her fellows blew up two of them but the last was very close to her when it exploded,” said Commander Shirin Abdullah, a spokeswoman for the YPJ. Antar had been part of a unit guarding the village of al-Yashli, which remained protected after the ISIS suicide bombing was thwarted.